Okay, we all admit that going trick-or-treat no longer excite us as it was in the primary school. 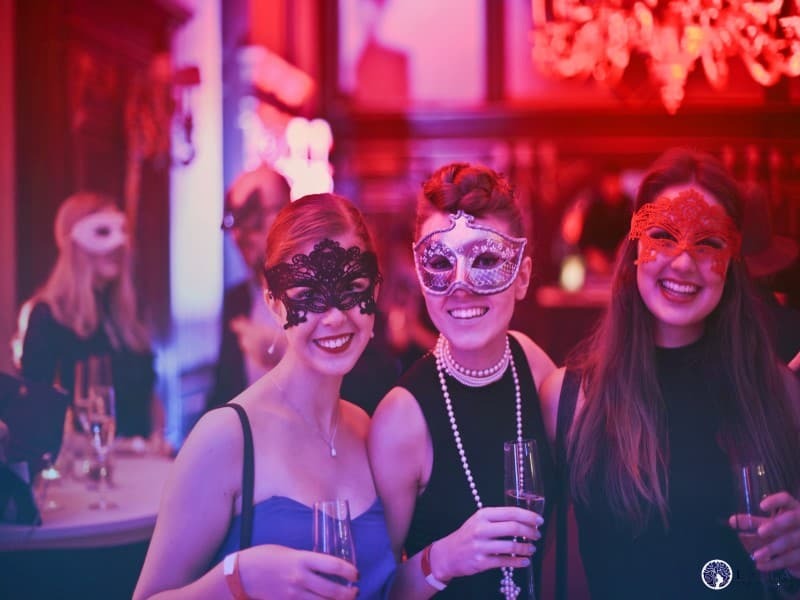 Halloween for adults needs more vibrancy and creativity. If you find the tradition is way too obsolete, then let the Layla Hair Halloween Promotion rock your party this year! Find out why we can and what we have to offer you. Every year, we spend a few bucks on a cheap-looking wig, hoping that it would bring us the spotlight. Did it? Do you even remember where you put your last costume wig? Also if you do, are you sure you want to wear it again this year? If you look at your Halloween pictures and realize you have worn the cheap-looking wig years by years, it’s time for a big change. It’s time to break away from boring Halloween costumes! You can’t expect to draw attention from anyone if you don’t invest in what you wear. That goes the same for outfits, make-up, and wigs. You may think Halloween is an annual event. It comes and goes. Why do I need to spend that much money on a wig if the game only lasts a night? My friends, this is where you get things wrong. You don’t spend money on the wig; you spend money on yourself. It makes you look nice and gorgeous. There are no reasonable excuses for not treating you well, especially on Halloween. So be authentic! Be unique! This Halloween is yours, and you need to make it special. Let Layla Hair Halloween Promotion help you with that. In recent years, the shift between cheap synthetic hairpieces and human hair wigs is significant. Many people realize that they should invest their money wiser, not cheaper. Human hair wigs cost much more than synthetic ones. However, before weighing the price, let’s see why you should choose the former not the later. Natural looking is what synthetic wigs fail to give you. The fibers look all out of places. Some cheap items even seem ridiculous. On the other scale, human hair wigs use natural human hair. The construction with lace and wefts (frontal lace wigs) makes the wig fit perfectly to your head. The lace color resembles your scalp. Nobody even knows that you are wearing a wig. Mermaids, Nurses or Mummys? Do you run out of ideas? Human hair wigs can help you change the way you think of Halloween costumes. Halloween costumes do not mean that you have to copy fantasy figures. They seem to be a great idea for those who are lazy. If you want a different Halloween, you need something more creative. Layla Hair suggests that you should try to dress up as famous figures. You can easily find tutorials online on how to make up like Lady Gaga, Taylor Swift or whoever you want to resemble. Why don’t you try Harley Quinn this year? The rest is easy. You need a human hair wig. The good thing is most celebrities use this type of wigs on a daily basis. Therefore, you can reuse the purchased wig not only in Halloween but also in different events. Layla Hair understands that our customers need a fantastic Halloween costume. 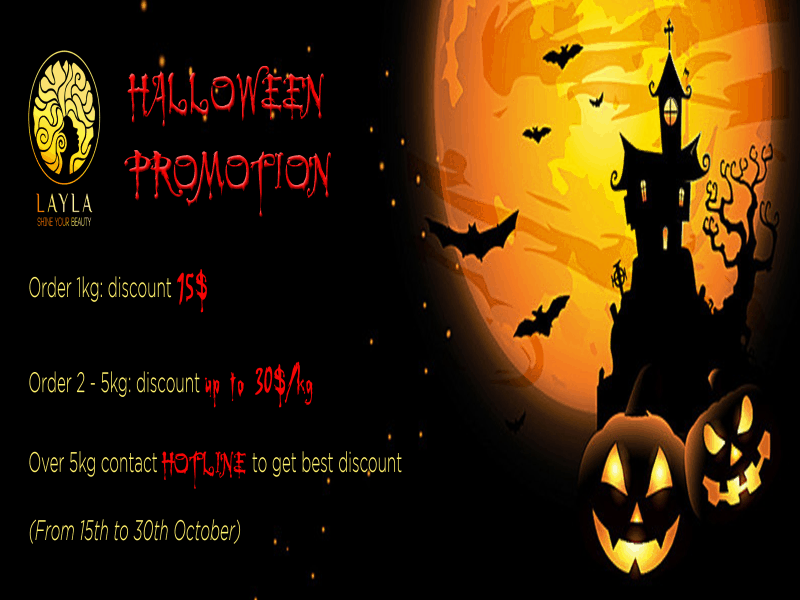 That’s why we present you Layla Hair Halloween Promotion. ♥ For every 1 kg you purchase, you will get a discount of up to $15. ♥ And if you order more than 5 kilograms, contact our hotline number to get the best discount. ♦ This promotion lasts from 15th to 30th October. Girls! This is a precious chance to have a unique Halloween. Don’t hesitate to contact us for Layla Hair Halloween Promotion! SHARE this promotion to your friends and hair salons to get the best price!